A few weeks ago, we had some top guests at the supper club - people whom we admire and look up to. The Food Urchin came to help in the kitchen! And so did Stuff Ya Face - whose become part of the furniture these days - we love having him around the place and bringing his smiles and positive energy to our home. Then we had The London Foodie bring a Brazilian TV crew round to film a documentary about the London food scene and about him, himself, Luiz Hara, Brazilian born, great foodie and cook and having great influence on how and where we should eat. It was a mad evening, people were everywhere, plus the crew and all their equipment. There is always something rocking in this house - we loved it! Luiz Hara always smiles like this whereever he goes - it always brings a smile to our faces to see him like this. Leonid, aka, Bob from Bob Bob Ricard also came with Mrs Bob to dinner! Imagine that! its Bob in the dinning room - OMG - we love his restaurant and him and how he is wonderful at making his guests feel very welcome in his beautiful place. We also met Rachel McGormack from Catalan Cooking. Its always a bit scary and nerve wracking to have guests such as these mega foodies. Hope she enjoyed the night. The Brazilian Crew and Luiz singing and dancing away as the Director plays the paino! And finally, lovely Mimi from Meemalee's Kitchen came with her husband, Mr Mimi. We met her at our picnic in Henley Regatta and was lovely to have her in our home. Supper clubbing has been so special. It is wonderful to be able to fill the house with so many wonderful guests and people who love food equally, if not more than us. It is a true honour, to cook and to serve to people who really appreciate being there and loving the whole experience. Its why we do it, over and over and over and people keep coming back again and again... Thank you for coming, its been a year since we started. Heard some GREAT comments about this evening, sounds like another success! WILL make it to F&L someday! @siany - thanks lovely! back at you! @Kavey - you will be our next guest of honour! You guys are certainly going from strength to strength. Congrats on your first year. Our first venture out to a supper club and what an absolutely fabulous time! We will definitely be back for one of your Vietnamese nights. I will also make sure to bring more than just the two courses of champagne! PS. I will trade you a bottle of vintage Pol Roger for one of your pain au bacons! Wow, so sweet of you to mention me in your post - it is lovely how you captured the crazy but wonderful evening we had at your home recently. I cannot believe that it's been only a year since you started F&L, you achieved so much in such short period of time and I am SO proud of you both. I wish you many happy years of F&L, and will always be there to support you (and have some fun too). This was such a good evening! Congratulations to your anniversary, you are clearly my favourite dinner destination in London. Looking forward to another year of your amazing food and some good parties! Happy first anniversary - all those positive comments above? Well deserved. Although I didn't come to this evening, coming to the next one was amazing. Everything i had hoped a supper club would be. Happy anniversary! Yours was the first supper club I went to - such a fantastic night and I keep meaning to come back. You do a brilliant job. Hope you come soon, its been an amazing year - we've worked so hard! Gladly will have you back here anytime! You are wonderful for coming in the first place. And Mrs Bob is so beautiful! Pol Roger for Bacon Swirls - sounds like a fair trade - we can bring you a whole roll to enjoy! : ) But firstly, we are coming to celebrate and eat more of your great food - Bob Bob Ricard is a place to come to enjoy life! although you bought one bottle of wine, the veterans at your table bought a bar so lucky you!!! You are such a lovely person and having you at the supper club makes us really really happy - so glad we met and become friends, otherwise wouldn't be without food, blogs and twitter! Thank you so much! It was so long ago that you came, We still feel a bit bad that that night was not one of our best efforts so hope you come again and get to try what we do now! 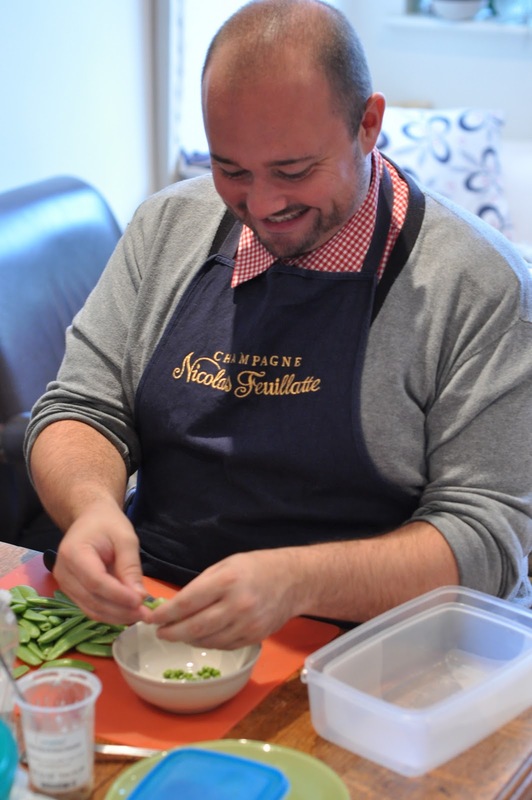 the smile on my face belies the fact that i was doing the most boring job in the world - shelling sugar snap peas - i still love you though!